What Path Would You Take? What would you be? Diving deep down into your imagination and digging into your “alter-you,” who would you be that is different from who you are right now. I mean, throw all caution to the wind and don’t worry about talent or money or practicality. Who or what would you be? Now, my life has led me down many different paths. Let’s see…I started out as a teacher, then an advertising sales rep, then a real estate developer, and now a Professional Speaker. In between, I was also an owner of a Quizno’s Sub, a manager of a bridal department and also led the visitor services team at Millennium Park in Chicago. WHEW! I better stop there. So, what about you? What would you like to be that is different from who you are right now? If you let your mind wander, you just may discover a different part of yourself. A new season is upon us, there’s no denying it. Just take a look around. 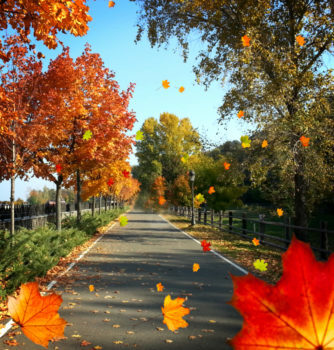 The falling leaves and the falling temperature are both sure signs that autumn has arrived. As I breathe in the crisp air and enjoy the changing colors, I can’t help but think of how this season parallels my life. First of all, there is change, and that is something we cannot control. Our only hope is to accept it and find a way to deal with it. Some change is harder than others, and many times we are brought to our knees because we don’t know how we will survive it. But it may help to remember that the longer nights, and the darkness, are always followed by light. No matter how long the night may seem, it WILL come to an end. So, keep your eyes open, enjoy your surroundings, and you may even discover some fun along the way. With Fall also comes Halloween and candy (peanut butter cups for me, please) and stomping through the leaves. When the time is right, you will be able to see the beauty – even in the darkness. Here’s to embracing the many twist and turns that life has in store for us. To tell you the truth, I wasn’t exactly sure myself. I had driven through it several times and was always awed by its beauty, but I wasn’t sure what else it had to offer. But off we went, my husband and I, on an eight-day vacation. Before we left, I researched “Top ten things to do in Idaho” and at the top of the list I found Craters of the Moon National Monument. Craters of the Moon dates back 15,000 years when lava erupted from a series of deep cracks in the earth. 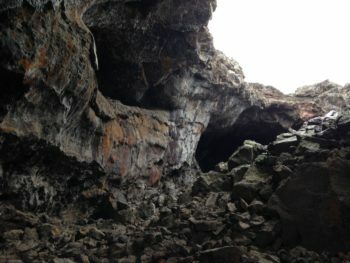 They formed these massive lava fields and lava tubes which are similar to caves. During our visit, we hiked over fields that reflected the fury of the lava, yet it left behind a beauty that cannot be denied. That’s when it came to me – that’s when the lava fields reminded me of the challenges I have faced in my own life. It reminded me of the times that my life erupted in fury, spewing changes that would crack my foundation and make me doubt all that I had worked for – all that I had become. Then, with time, that fury froze. With time the scars and cracks and fierceness became something beautiful and fulfilling. It created paths that would lead me to a new life. Just like the hot lava, when we are going through changes, we need time to see the beauty that can come from it. It’s one of the hardest things to do, but once accomplished, the most rewarding. It’s a map of where we have been and of all that we accomplished. It fills in the pieces of the puzzle that were missing, changing the scenery along the way. 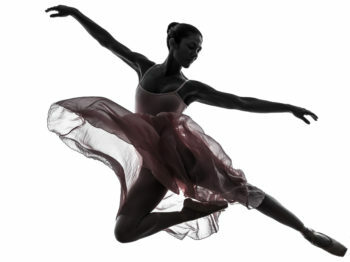 The fierceness and fury flows to a new beginning, waiting to be discovered. If you’d like to learn more about Craters of the Moon National Monument and see its beauty, check this out: https://www.nps.gov/crmo/index.htm. It truly was a treasure to find. 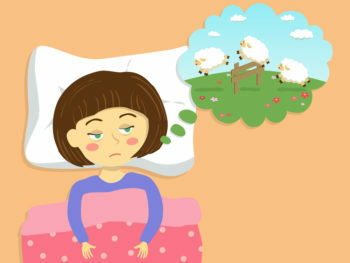 Counting Sheep – Baaaaad Idea! However, there is one thing that somewhat helps me. My friend, Debbie, suggested I listen to Metta Chanting. “Metta what?” I asked. So she sent me this link: https://binged.it/2zNrGBo. Now it doesn’t help me all the time, but on those occasions when it does, I am very grateful. There’s something peaceful about it; relaxing. So I thought I would pass this along to my fellow insomniacs. If you’re desperate enough, you’ll try anything. Who knows? It just may work for you. Happy ZZZZZZZZZ’s. 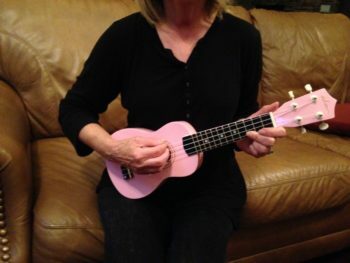 Yep – I am now the proud owner of a pink ukulele. Now I’m sure you’re wondering what’s the big deal. Or more importantly, WHY I want a pink ukulele. The real answer? I’m not really sure. About 1 ½ years ago, I saw a Christmas concert where the performer played a ukulele while singing the song Hallelujah by Leonard Cohen. I was quite taken by it. Then about a month ago, I opened the class schedule for our local college and there it was – beginner ukulele lessons. The opportunity presented itself to me and it just sounded like an interesting thing to do. I’ll have none of that. My first lesson is on October 31st and runs for six weeks at two hours per lesson. I’ll be there proudly holding my pink ukulele up high. And I must give a shout out to my husband and send a HUGE thanks his way. He actually listened to me talk about this crazy idea and gave me that ukulele as a birthday gift. It’s always great to have someone in your corner. Now watch out for my next presentation. You just may get serenaded on my new toy.